Toronto improviser Xuan Ye used her Kazoo! 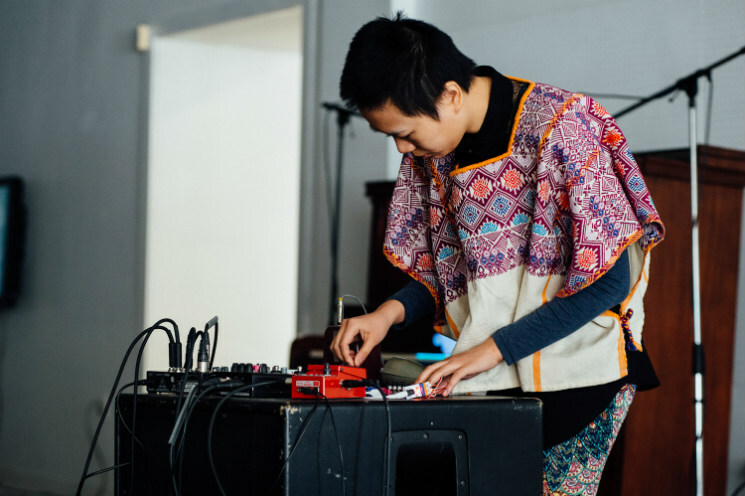 set to fold instruments in on themselves, looping sound and ideas into cyclonic symmetry. Stationed behind a bank of pedals and other noisemakers, she opened her piece with some dizzying loops and feedback experimentation that pitted an orbiting microphone against a HoneyTone amp, looping it all into swirling carnival nightmare oscillations and adding blips and bleeps to further disorienting effect. In a brilliant second act, she wandered over to a multi-mic'd upright piano to lean into some tumbling keyplay while looping intermittent barnyard noises she solicited from an oinking pig toy. She'd later shift her focus to a series of tactile microphone explorations, seizing a vocal mic to hammer it across the keyboard and drop it into the piano's interior to wreak havoc on its innards, the blunt object feeding the PA with its own physicality in knocks and scrapes. Then, dangling it to the ground and letting it flop across the concrete, Xuan set back towards her looping station and proceeded to rub and bump the mic against her gear, measuring what textures she could get out of the knobby terrain, new sounds thundering around the nauseating feedback when she returned to the mini amp.